This was my book club’s selection for January and I’m glad it was. Memoirs are not really my first personal selection, so I like when I’m “forced” into choices outside of my norm. 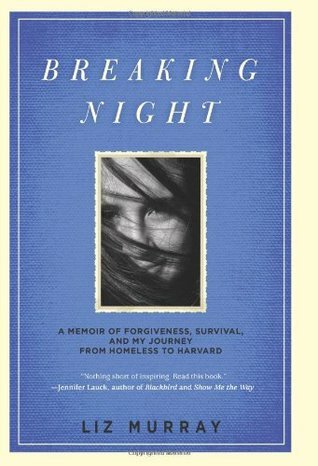 Breaking Night follows Liz Murray through her life, starting at age 3. She shares with readers what it was like to be the child of two coccaine addicts—which meant the monthly check was spent almost entirely on drugs within the first week, and then the rest was spent on just enough food to keep the children fed once a day or some times every other day. Meaning, basically no money was spent on food. There were two times that I set down this book in the middle of reading and tidied up the house and gave more attention to dinner than I normally do. I kept thinking, “I can’t give my kid much, but I can make sure she’s loved, clean, and fed.” Basically, for her entire childhood, if Liz had a problem or a need, she had to figure it out herself. And some times those solutions were splitting a tube of toothpaste and cherry chapstick for dinner with her sister, not showering for weeks at a time, and finding the best ways to avoid social workers. It was interesting to me to read about Liz’s love for her parents despite the neglect. But the biggest impact on me was the things other people did that inspired Liz to better her situation. These weren’t always huge things that people did for her, but the small things that made her realize she could take charge of her situation and change it. It made me want to be a better and kinder person. You never know what small kindness can make a big impact on a person. One of the issues we had as a book club, which I didn’t even noticed myself until @ursula_uriarte pointed it out to me, was how much detail was in her memories, starting at 3 years old. We all had long discussions about memory and if this memoir was embellished. Who knows. I know it really put a lot of people off of the book, but for me overall the story made some real lasting impressions. It’s a pretty horrible childhood that Liz endures. She went from Homeless to Harvard, and when you read through the life she had and her attitude towards school (she hated school and never ever went) it’s amazing that she turned herself around to pick herself up largely on her own determination. This left me feeling inspired and motivated to be a kind and loving person. You never know who is in need.